Samsung Update Plus comes in, allowing you to easily download all the latest Samsung applications and updates for free, either automatically or whenever new releases are available. 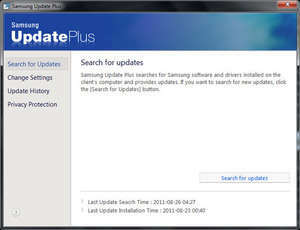 Samsung Update Plus is a software program that maintains the drivers, software programs, and Operating System (OS) patches installed on a user’s PC at their optimal conditions at all times. Samsung Update Plus will enable you to keep all critical system software components up to date. For security reasons, you should also check out the Samsung Update Plus download at LO4D.com which includes virus and malware tests. Additional screenshots of this application download may be available, too. Samsung Update Plus download been highly rated by our users.